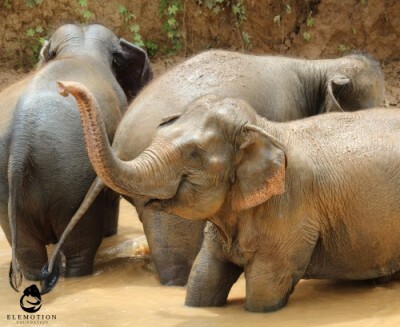 Visiting a sanctuary is the best way to see captive elephants and witness their true spirit. Watch them play, mock fight, suckle, swim, graze, communicate, and interact. You will not see this many kinds of natural behaviors at a zoo, circus, riding camp, or temple. A sanctuary is a place of refuge and protection. 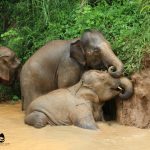 Elemotion Foundation believes that a true elephant sanctuary puts the needs of the animals above tourists’ desire for entertainment. A visit to a good sanctuary is an educational, magical, and memorable experience. Captive elephants should be given the opportunity to live as freely as possible. A good sanctuary does not require the elephants to work and provides them with plenty of space and free time. Understandably, every park or sanctuary has limitations to the amount of freedom it can allow. Some captive elephants may need special management techniques due to aggressive behavior, social incompatibility, musth periods, physical or mental illness, injury, pregnancy, calf at heel, or old age. The size of the land and access to a body of water are important factors in determining whether or not the elephants can graze, bathe, and roam on their own. For their own safety, the elephants must be kept within the sanctuary’s property limits. However, most sanctuaries do not have a fortified containment system along the perimeter. Moats, solid walls, vertical spaced bollards, mesh grids, electric fencing, or a combination of these methods are good options. Nevertheless, these structures are expensive, difficult to maintain, and not always fool proof. Therefore, some sanctuaries chain their elephants or put them on hobbles or drag chains for the night. Whatever the method, a true sanctuary will strive to allow their elephants the most time possible unrestrained. 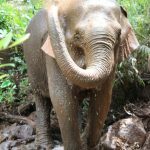 Sanctuaries assign each elephant at least one specific mahout (handler or caretaker) who will observe, guard, and follow the elephant throughout the day. The traditional hook, which is a tool used by the mahout to control the elephant, is a controversial subject among foreign tourists. 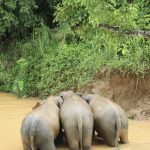 Good sanctuaries strive to select mahouts who are sensitive, caring, skilled, and understand the best to way handle the elephant without using a hook. However, some sanctuaries will allow their mahouts to carry a hook in case of an emergency or when in charge of an aggressive animal. 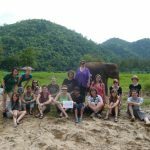 Elemotion Foundation recommends that tourist-elephant interaction be kept to a minimum. Limited interaction allows the elephants to relax and exhibit their natural behaviors. If performed correctly, feeding, bathing, petting, and photo ops may not be harmful for some elephants. These activities may be done on occasion, with a willing elephant, a few tourists at a time, and under the supervision of a staff member. 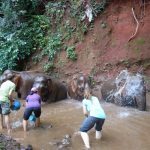 However, these activities are usually done for the benefit of the tourists, not the elephants. Please keep this in mind when participating in these types of activities. The best photos are often taken from a respectful distance when the elephants have forgotten you are watching! The best sanctuaries limit the amount of visitors per day. Constant disturbance and interaction with the public can be irritating and stressful. 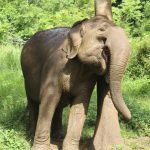 Elemotion Foundation prefers that the number of tourists interacting with the elephants is roughly equal to or less than the number of elephants present. Always listen to your guide and keep a safe distance. Please beware: words such as ‘sanctuary’, ‘eco-tourism’, ‘rehabilitation’, ‘foundation’, ‘orphanage’, and ‘conservation center’ can be used by any establishment irrespective of their actual standards, practices, or non-profit status. There are no laws governing the name an establishment gives itself. Therefore, tourists looking to visit a reputable sanctuary must not allow the name of the establishment to lure them into a false sense of security. 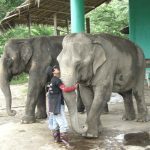 A true sanctuary does not allow rides, sitting on the neck, painting, shows, tipping for feeding and photo ops, or any exploitation of young or injured elephants. 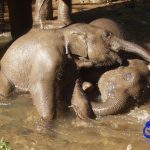 For our list of recommended parks, sanctuaries, and other elephant friendly activities, please click this link, Ele-Friendly/Responsible Tourism.